With the April 2 runoff election to decide the next mayor of Chicago, one of the Windy City's most famous natives is throwing his hat into the political ring. 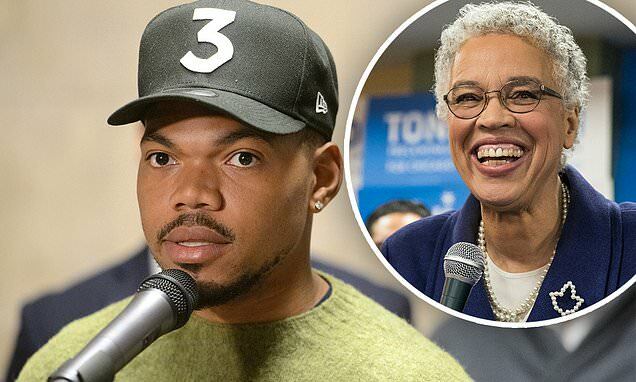 Chance the Rapper (born Chancelor Jonathan Bennett), 25, held a press conference on Thursday at City Hall in Chicago, to announce his endorsement for Democratic mayoral candidate Toni Preckwinkle. He also voiced some concerns he had about Preckwinkle's opponent, Lori Lightfoot, a former federal prosecutor and staunch advocate for police. 'The resounding voice has been that they don't necessarily feel comfortable or safe going into a city where Lori Lightfoot sits on the fifth floor,' Chance said at the press conference, as reported by the Chicago Tribune. 'Her past record as a prosecutor has not been in the best interests of young black people in Chicago, hasn't been entirely truthful, and even the campaign and the image she has created since the February election has been, like I just said, very untrue,' the rapper continued.